Tom Boonen (Quick Step) won the final stage and sealed overall victory in the Tour of Qatar on Friday, proving that yet again that he will be a major contender in the early season sprints and spring classics. 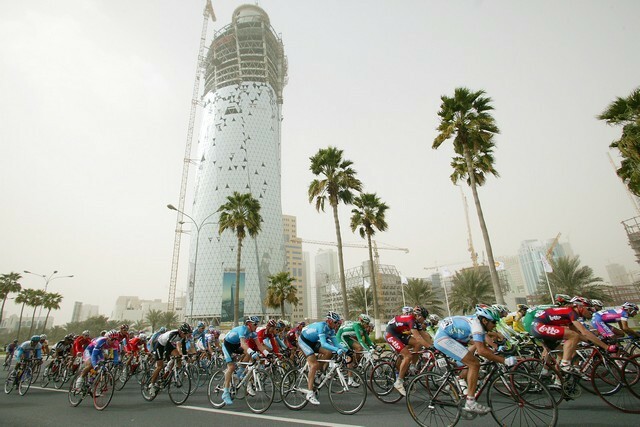 Boonen had been beaten by Alberto Loddo (Tinkoff) and Danilo Napolitano (Lampre) in the two previous stages but bounced back to win the shortened final stage ahead of Loddo and Luciano Pagliarini (Saunier Duval) on the spectacular Doha Corniche. It was Boonen?s third stage win in this year?s race and the second time he has won the overall classification. He won the gold jersey in 2006 and has now won 14 stages in the Tour of Qatar in five editions of the race. He won three sprints this year and his Quick Step team also won the opening 6km team time trial prologue. Thanks to picking up time bonuses in intermediate sprints and at stage finishes, Boonen finished 27 second ahead of team mate Steve De Jongh, with promising young Belgian rival Greg Van Avermaet (Silence) third at 40 seconds. Britain?s David Millar again finished in the main bunch after the windy stage, finishing 8-27 behind Boonen. Millar finished 61st overall, 24-06 behind but was happy to raced hard for a week in Qatar. His next objective will be 3.4km prologue time trial at the Tour of California on February 16.